Due to the large number of footnotes from primarily Russian language sources, they have been omitted from this online version. See www.slavicreview.uiuc.edu/ for information about subscriptions and back issues. bolshevized trade unions, and the ideological influence they exercised, the opposition gained the upper hand. Suppressing the opposition and "regaining the upper hand" thus became, for Aronson and others, the first necessity of early Bolshevik politics and the cornerstone of "communist autocracy." The importance of these issues to our understanding of early Soviet history has prompted me to raise them again here, and to examine in particular the validity of conceptualizing labor opposition to the Bolsheviks between October 1917 and July 1918 in essentially political terms. I shall focus on several longterm patterns which were of great importance in these months; look closely at certain social characteristics of the opposition movement in Petrograd which may have had a greater bearing on events than we have recognized; and attempt, finally, to relate these characteristics to the failure of the opposition to "gain the upper hand" in the capital. It may then be possible to frame a broader argument by way of conclusion about the failure of labor protest generally in this period, and to gain a somewhat fuller understanding of the complex processes involved in the Bolsheviks' consolidation of power. At the risk of emphasizing the obvious, I wish to stress, first, that while the Bolsheviks came to power reflecting politically the perceived interests and the will of a great number of Russia's fifteen to eighteen million workers, they did so only as part of a vast social upheaval over which they had very little control. Theirs was, to be sure, a critical part, vital to the political outcome of 1917; but equally important was the way in which the overthrow of the old order involved, simultaneously, a massive and for the Bolsheviks ultimately problematic assault on a wide array of social relationships and values that reflected Russia's political institutions. Authority based on traditional social hierarchies in the workplace weakened dramatically, for example, as it did in the army and elsewhere, as the political power of the Provisional Government began to decline. What emerged from this assault was not only the social polarization and civil-war mentality used by Lenin and his comrades to such great political advantage, but a new understanding of the nature of "democratic Russia" on the part of ordinary workers and peasants, reflecting elemental notions of social dominance-vlastl-rather than the relatively rarefied (and non-Russian) concepts of a rule of law and universal civil liberties. But what needs to be stressed in this regard is not the obvious relative political strength the Bolsheviks had gained by the fall of 1917, or their skillful arrogation of mass "democratic" commitments to further mobilize workers, but rather the party's weakness in facing the monumental tasks of Russia's social and economic reconstruction. Crucial to the emergence of Lenin's new order, moreover, was a familiar range of new or newly reestablished mass organizations-factory committees, trade unions, workers' control organizations-which not only reflected workers' ideas about democracy and social change, but which also (and more importantly for the purposes of this article) represented workers' solutions to very real social and socioeconomic problems. While the Bolsheviks increasingly identified with these mass organizations as the revolution unfolded, as John Keep has shown in some detail the organizations were not primarily of the party's making any more than the overthrow of the tsarist regime had been. On the contrary, it remained quite unclear to Lenin and others in the party leadership, whose sights were focused on securing political power, exactly how these organizations or the values they reflected corresponded to the requirements of a communist order. The party's support for institutions like factory committees was conditioned in large measure by the desire to destroy bourgeois Russia, and by the fact that many in the committee movement became Bolsheviks themselves. The further social upheaval required to complete the assault on Russia's "bourgeois order" was also clearly an impediment to the creation of the stable socioeconomic conditions ultimately necessary for social welfare, as well as for socialism. At the same time the Russian workers' movement of 1917 was itself a product of long-term processes of change, including the uneven and dependent nature of Russian industrial development during the war and the varying impact of the war itself on different industrial and social groups. While the period between July 1914 and the spring of 1915 brought some dislocation almost everywhere, the needs of the war soon began to strengthen some industries. By the late spring of 1915, as state resources were being mobilized to support defense production, and deferments and exemptions were introduced for skilled workers (along with new regulatory commissions), a complex process of industrial segregation began to unfold, separating "favored" industries from those the state was unable or unwilling to protect, on one hand, and identifying particular branches of production (and particular plants) for special consideration, on the other. The broadest patterns of segregation can be seen in industrial output. While total production grew about 21.5 percent between 1913 and 1916, this was almost entirely the result of increased output in only two sectors, metals and chemicals. In the two industrial branches that employed the greatest numbers of workers, food processing and cotton textiles, output fell 22 percent and 18 percent respectively between 1913 and 1916. These differential rates were at least partly attributable to the nature of government intervention. State resources began to pour into weapons and armament production, especially in Petrograd, and into the production of gunpowder and explosives, soon the major product of chemical plants. These sectors were also given priority in fuel and resource allocations and were the beneficiaries of new machine tool imports, financed at state expense, which helped to increase output per worker 40 percent in metals and 30 percent in chemicals between 1915 and 1917. By contrast, output per worker fell between 15 and 20 percent in almost all other sectors, and more than 30 percent in lumber mills and factories making wood products. Textiles were particularly affected. At the same time the largest and most lucrative military contracts were bestowed on a relatively small number of major producers; and as late as February 1917 demand for military goods from Petrograd metalworking plants was still about 16 percent greater than their production capacity, a ratio which, among other things, allowed Petrograd metal workers the luxury of striking without great fear of massive retaliation. In the chemical industry the demand of the state was even higher. These developments had important social consequences, some of which are well known. The number of metal workers in Petrograd increased 400 percent between 1914 and 1917, for example; the number of chemical workers 250 percent. These enormous increases, however, were accompanied by, and in part engendered, a severe instability in the workplace, even in the chemical and metal industries. At Putilov, for example, 9,000 employees left their jobs in 1915 alone, some to join the army, some to find higher paying jobs elsewhere. At the Treugol'nik rubber plant in the nearby Narvskii district, the number of workers replaced in 1915 may have exceeded 10,000. While precise figures on these changes are lacking, their dynamics are clear and quite extraordinary. In Russia as a whole, at least one-third of all workers employed in January 1914 had left their jobs by 1917, and the actual figure was probably much higher. More than 300,000 filed through the Moscow labor exchange alone during the first nine months of its operation in 1915-16. We know, of course, that many newcomers to the industrial labor force were women, and that their employment was accompanied by a decline in real wages in all industrial sectors. More important for the purposes of this article, however, is the likelihood that these and other changes contributed to the erosion, in particular, of the relative security of skilled workers, both in terms of real wages and as a result of the introduction of new machinery, new factory discipline, and the further rationalization of work processes. Similarly, we know that these developments took place against a background of rising living costs, growing shortages of food and other essentials, and increasing labor militancy, particularly in Petrograd; and that manufacturers and the government responded in many places with arrests, dismissals, fines, and tactics like compulsory overtime, which added greatly to the burdens of maintaining some semblance of family stability or welfare. It is important, finally, to emphasize at least in bare outline some of the ways in which all of these processes related to Russia's revolutionary development in 1917 and helped to define the problems that Lenin and his comrades might be said to have inherited as they came to power in October. Not least among these was the way in which February was heralded by many workers themselves as the opportunity, at long last, to establish some degree of stability and order in the workplace, in part by ending the arbitrary and repressive behavior of managers and foremen, in part by assuring steady and orderly production with adequate wages and secure jobs. This desire for security was undoubtedly felt strongly by skilled workers and artisans hoping to maintain the traditional perquisites of their crafts; but it was clearly felt as well by semiskilled machine operators and even unskilled workers (chernorabochie), who must have looked with some envy at their better paid and more secure comrades. In any event, the important points are that this quest for security was very broadly based; that it accompanied the more familiar expectations for an improvement in material welfare in 1917 (reflected, for example, in the wage and hour demands of strikers in the spring); and that both sets of aspirations accompanied from the start more politicized hopes for the creation of a democratic order. Yet in objective terms, one of the most salient aspects of 1917 was the inability of the provisional regime not only to stem the processes of economic deterioration throughout the country as a whole but to prevent its spread into "favored" industrial sectors. Most important, defense production fell by as much as 40 percent between February and July; and output from all metalworking and machine plants declined by almost a third from 1916. Coal production in the Donbas, which had been as much as 172 million puds as late as November 1916 and which was crucial to iron and steel production, fell to less than 110 million puds by the end of the summer. Reserves awaiting shipment at mine heads were only one-fifth of what they had been in 1916.'' By early 1917 many plants, like the Parviainen works in Petrograd, had less than a single day's reserve of coal. Putilov, which used about 10 percent of all industrial coal deliveries in the capital, was receiving by mid-August only one quarter of what it needed. If by late summer of 1917, therefore, "crisis" had become a common term in all Russian public discourse, one must especially appreciate the ways in which the country's threatened economic collapse now raised the specter of massive hardship and ruin even for "privileged" workers in the Petrograd metal plants. Russia's economy seemed threatened with systemic collapse. Central financial institutions like the stock exchanges began to weaken, along with the various regulatory agencies governing commodity exchange. The normative processes of capitalist finance-investments, loans, issuing stocks and bonds, collecting receivables, the repayment of debt-were all seriously disrupted by the summer of 1917. Risks increased drastically. The state banking apparatus came under tremendous pressure. What must be emphasized is that these circumstances seemed to many to require energetic state intervention at precisely the moment when the Provisional Government itself was under increasing attack from all sides, and mortally weak. It is important conceptually, as it was important tactically for Lenin and other activists at the time, to distinguish "state" and "government" in this regard. The government clearly was ineffective. Increasingly this seemed due to the ways in which, as Bolsheviks and others insisted, it reflected "bourgeois" interests. The state apparatus itself, however, still seemed to afford workers at least the possibility of economic and social relief, especially with the formation of the first coalition in May and then again after July, when the soviet's declaration of July 8 became, in effect, the platform of the second coalition. Countless workers' delegations demanding assistance besieged state offices throughout this period, even as the "bourgeois" ministers themselves came under increasing attack. And if from the standpoint of democratic politics one can understand the Provisional Government's reluctance to have the state intervene further in the economy, one can also understand why growing numbers of workers came to see the provisional regime as reflecting, above all, the failures and insecurities of "bourgeois capitalism ." It is within the context of these larger processes that one must appreciate the enormous impact of more immediate changes, both before and after October, and understand important aspects of the workers' own response. Here one must note in particular not only the familiar range of problems associated with the formation of factory committees and other autonomous workers' organizations but the related emergence of two broad tendencies among workers that also had a bearing on events, and which were contradictory in important ways. On one hand there emerged, as S. A. Smith has argued convincingly a forceful (and increasingly strident) sense of proletarian class identity - a generalized class consciousness that reflected broad patterns of social polarization, was of crucial political importance, and served a vital role in the Bolsheviks' coming to power. On the other hand, however, there also emerged a somewhat less familiar but equally important concurrent tendency toward what one might call "localism," for want of a better word, in which traditionally unifying national loyalties and commitments gave way to concerns bounded by factory gates, and in which the developing characteristics of proletarian (and peasant) social hegemony were increasingly defined in terms of particularistic (rather than class) interests and needs. This localism was at once a natural result of the need workers felt to find immediate "solutions" in 1917 to the problems of their own plants and factories, and the result of long-term social influences: craft identities and consciousness, common backgrounds (zernliachestvo), and similar factors. The factory movement in 1917 also showed both unifying and particularistic tendencies, since it was at once a reflection of the need workers felt to find immediate solutions to untenable conditions within their own plants, and an important element in the process of forming powerful class associations and identifications, which for a time, at least, more than balanced centrifugal influences. As Russia's crisis deepened, however, and class-conscious workers increasingly took local matters into their own hands, the defensive (and particularistic) functions of factory committees took on increasing importance. Moreover (and especially important to events after October), the strongest and most active factory committees emerged in Russia's favored and most protected industrial branches and plants. More than half the delegates at the first conference of factory committees in Petrograd in late May and early June, for example, were from the metalworking plants in the capital. They represented more than 230,000 workers in 134 enterprises and, as an industrial group, constituted a delegation eight times larger than both the next most heavily represented branch, the printers, and the textile workers. By August 1917, at the second Petrograd conference, chemical workers constituted the second largest delegation and by then had almost three times as many representatives as the printers. It is important to emphasize again the obvious political aspects of this process. As Smith demonstrates in Red Petrograd, factory committees played out within an enterprise the broader struggle for control over resources and the distribution of power. At the same time, both moderate soviet leaders and Provisional Government figures could not fail to incur the workers' animosity as they tried to restrain the growing influence of the committees. "Precisely now," workers responded in late summer when the socialist minister of labor Mikhail Skobelev tried to set limits on committee power, "when disruption of the economy is reaching new heights, when firings have become massive and factories all over the place are being closed and evacuated, the intensive, unrestricted and most diverse work of factory committees and their central organs is absolutely necessary. "Not only were the workers' groups powerless to stem the systemic disintegration of Russia's state capitalist economy in 1917; they made matters worse. More important in terms of developments after October, they also increased by their actions an overall dependency on state-as opposed to market economic mechanisms. It is at least partly for these reasons that the Bolsheviks soon appeared so attractive to many Russian workers in 1917, especially in Petrograd. Lenin and his comrades offered at the same time an explanation for Russia's crisis and the hope that complete disaster could be avoided if government authorities used the country's seemingly vast state resources in the workers' interests. Thus the Bolsheviks' own arguments about the relationship between the war and capitalism generally, their insistence that Russia's threatened economic collapse could be largely attributed to industrialists "sabotaging" the revolution in order to preserve social and political hegemony, and above all their emphasis on seizing state power and using it to "smash the capitalist order" seemed both to explain Russia's crisis and to promise effective, permanent solutions-all the more so because the arguments contained some elements of truth. Russia's particular form of capitalism was failing, as a system of finance, commodity exchange, social relations, and industrial production-in sum, as a mode of production-as indeed it had already begun to fail before February, a process at once the cause and consequence of political weakness, social upheaval, and the carnage of war. It was little wonder that thousands of workers with varying degrees of political consciousness regarded so enthusiastically the "overthrow of capitalism and the end of the bourgeois order," and anticipated so hopefully an end to the insecurities of liberal democracy. One of the most salient features of revolutionary Russia in the eight months or so after October was that nothing changed for the better. This realization, and the even more precarious, uncertain conditions which soon emerged, disturbed and angered broad groups of workers. By early summer there were widespread anti-Bolshevik protests. Armed clashes occurred in the factory districts of Petrograd and other industrial centers. Under the aegis of the Conference of Factory Representatives (Sobranie Upolnomochennykh Fabrik i Zavodov Petrograda), a general strike was set for July 2. That this would be the short-term outcome of one of the most momentous changes in Russian history was not, of course, suspected by most workers who celebrated in October as effective capitalist management began to disappear from their factories. For a few weeks there seemed to be a genuine and widespread belief that the workers themselves could find at least temporary solutions to the problems besetting their plants, and that Bolshevik rule would assist these efforts, both by using state offices in their support, especially banking and financial institutions, and by restoring some semblance of economic control. By early December, encouraged by the Bolsheviks' draft decree promising the "legal" extension of workers' control in all enterprises with more than five employees, workers had organized committees in more than 2,100 major enterprises, including 68 percent of all plants with more than two hundred workers. Scores of plants and major railroads were "nationalized" from below in the expectation that this would finally guarantee effective state assistance".What had begun to happen before the October revolution now happened more frequently and more openly," E. H. Carr writes of this process. "For the moment, nothing would have dammed the tide of revolt." Yet it is doubtful that the principal force behind this "tide of revolt" after October was essentially a political one, and even unlikely that many Bolsheviks were primarily concerned with workers' control in order "to secure the allegiance of the working masses," as Paul Avrich has suggested. The consolidation of power was clearly the central concern of Lenin and his comrades, and the factory committee movement was obviously of political importance, but what occurred in November and early December was not so much revolt (or perhaps, more precisely, not only revolt) as an effort by the workers to stave off total economic disaster on a local level by securing a dominant role in plant affairs. In political terms the revolt was largely over. State power, such as it was, belonged to workers' parties, even if not yet to the Bolsheviks alone. The enormously difficult (and frightening) task now was to cope with production problems and to manage to survive, a task that the workers simply could no longer leave to others and for which now, more than ever, they needed state support. The very necessity of this process further strengthened the defensive characteristics of factory committees in these weeks. November and December 1917 were months in which factory committees desperately sought new orders for goods, had to procure scarce materials and supplies, turn up funds to pay workers, and resolve their own difficulties with technicians and other experienced administrators in order to keep plants running. In many places managers and workers' representatives signed papers together in order to receive funds (especially from private banks) or procure goods. Elsewhere, seats on factory committees were given to office workers (sluzhashchie) or technicians to prevent their departure and assure their help. Collegial administration emerged as a common form of management, in other words, because it seemed the most effective way to get things done. Meanwhile, committees explained their actions at frequent meetings and sought popular confirmation for their policies through "plant democra~ y." For a period of time, moreover, perhaps no more than six to eight weeks, many in the factories must have thought these efforts were working. Taking control of production in many enterprises gave the committees immediate access to financial reserves and other resources remaining in the commercial "pipeline." Some new funds thus became available for the moment to increase pay, procure materials, even settle outstanding obligations in cases where this was demanded by suppliers in return for their goods. Private wealth, of course, was also confiscated and in many places redistributed to workers along with space in apartments or other sequestered living quarters. Improvements may also have been due to the fact that workers entered their plants in early November with a new sense of commitment and enthusiasm, convinced their insecurity and dislocation would soon come to an end. Buoyed by a political triumph which wrested state power from the bourgeoisie, confident of their own ability to manage affairs, elated by the reality of their new social-dominance, Russian workers as a whole, and particularly workers in Petrograd, could hardly fail to expect that conditions would improve as their leaders and comrades within the Bolshevik party now began to employ the full resources of the state in support of their own class interests. Irreversible forces were already working to pulverize these hopes, however, and to destroy even a semblance of economic order. The very process of draining the "pipeline" for immediate gain made ultimate disaster inevitable unless the flow of goods could be increased at its source. This required the total reconstruction of Russia's economic infrastructure (to use a jargony term), a task difficult enough in any circumstances, but now virtually impossible in the time required to maintain the supply of goods and materials needed to keep most plants in operation. It also became clear that little effective assistance would be forthcoming from various state agencies, even for nationalized plants Although they had taken over state banks and other offices, the Bolsheviks were simply not able to provide the relief that the workers expected and which their coming to power had promised. Quite the contrary, in fact. The seizure of state power contributed enormously- if indirectly-to undermining the workers' material well-being by precipitating one of the most rapid and least controlled military demobilizations in history, a process that had begun before October but which now erupted without restraint. The more familiar side of demobilization involved the breakup of the old army: within weeks, hundreds of thousands had left their units, armed, impatient, often angry. But it meant as well the reorientation of industry from war to peacetime needs, an overwhelming task even in conditions of relative political stability. In Petrograd and elsewhere, more than 70 percent of all Russian industrial production was now directed toward military needs; some 80 percent of the industrial work force was in defense-related occupations. As late as September 1917 there were also 7 million men still in uniform. As the Bolsheviks pursued their peace plans and the army dissolved, most state procurements ceased. In some places, manufacturers stopped production in midstream. Elsewhere payments were not made when goods were ready in early November. 32 Delegations of anxious workers pressured soviet and state officials alike for relief as difficulties mounted, but the magnitude of the problem was simply overwhelming. The Sovnarkom itself may even have made matters worse by decreeing in December that strictly military production should cease entirely ("for example, work on artillery shells"), an order that sent shock waves through plants like the Petrograd Trubochnyi works, in 1917 Russia's largest producer of shell casings. Factory committees and unions were simply to "take the most decisive measures to find work" for displaced workers, "sending delegations to the Urals, to the north, and so forth, in order to work out necessary arrangements. Late December and early January thus saw a transition in proletarian Russia from relative enthusiasm, optimism, and even some limited material improvement to extremely rapid economic decline, deepening insecurity, and in some places outright panic. As is well known, the very center of proletarian power, Petrograd, with its heavy concentration of armament and other defense industries, suffered most. Between January and April 1918 the supply of goods coming into the capital dropped precipitously in almost every category. Nearly 60 percent of the industrial work force here was forced into the streets. Aggregate figures are less important for our purposes, however, than the distribution of unemployed workers by industrial branch in Petrograd. And it is not simply the extent of the crisis that is most striking but its unevenness, and more particularly the extraordinary concentration of unemployed workers in what had been Russia's most favored industries and plants. The greatest declines by far were in chemicals (including rubber) and metals, 79 percent and 74 percent respectively in April 1918, relative to January 1917. These two branches, moreover, had employed by far the greatest number of workers in Petrograd before October, about 250,000 (more than 70 percent), excluding those in service occupations. Hence the spring of 1918 saw the emergence of an extraordinary concentration of unemployed workers in what had been the city's best paid, most numerous, and most secure section of the work force, employed in the largest and most productive plants. In contrast, Petrograd textile workers, who had suffered extraordinary dislocation during the first years of the war, now suffered only a 15 percent decline (21 percent if one includes the 5,000 or so workers who had been employed in cotton cloth manufacturing, where production was now further curtailed because cotton imports were shut off); leather workers, a decline of 31 percent; food workers, 23 percent, and paper manufacturing, 22 percent.37 The Bolsheviks' decision to evacuate Petrograd clearly contributed to the crisis. Information is obviously incomplete, and the process itself was chaotic. Even so, it seems clear that the largest group of out-migrants consisted not, as one might suspect, of skilled workers being transferred to industrial centers elsewhere in the country, but of unskilled workers and recent immigrants. Even allowing for errors in the records, it therefore seems likely that a very large proportion of unemployed workers remaining in the capital were skilled and semiskilled metal and defense workers-the very social group, that is, which had enjoyed such relative prosperity before February, which constituted one of the Bolsheviks' strongest bases of support in the capital throughout 1917, and also the group whose revolutionary expectations had been raised the highest. While the magnitude of this crisis in both objective and subjective terms is hard to measure, it is also difficult to underestimate. So is the suddenness with which it undercut the hopes of the workers. February and March 1918 were months of precarious uncertainty in Petrograd and elsewhere. Factories that stayed open were unable to get new orders for goods. Supplies and materials dwindled. Funds dried up. Pilfering and theft were common. Decrees from the center were "almost totally ignored." Productivity, of course, fell precipitously. The more mechanized a plant (and thus the higher its complement of skilled and semiskilled workers), the greater the problems of maintaining production, given the lack of fuel and spare parts. It is hardly surprising that in these circumstances some workers sold off machinery and equipment, acts ridiculed by observers as brainless anarchism. What is important is not so much the magnitude of this disaster in statistical terms as the ways in which it may have acted quickly to undermine the workers' confidence and sense of unity and the ways in which it may have given new impetus to centrifugal tendencies that had largely been overcome in the fall. Questions of worker unity and the broad issues of power were now, for many, largely past, partly because many activists were themselves siphoned away from the factories, partly because, as one Bolshevik observer put it, political questions per se were no longer urgent with workers and Bolsheviks in power. What mattered instead was getting help "from above," and how individual factories were being managed, a situation that put enormous pressure on workers' committees. It was now the committee's responsibility alone, even in plants still under private ownership, to decide what to do with demobilized soldiers who appeared at the gates and demanded their old jobs back; and it was logically the committees which now assumed responsibility for regulating wages and imposing plant discipline-or, as V Maiskii put it in April, for finding "disciplinary mea-sures . . . which appeal[ed] not to the best but to the worst side of human nature, not to revolutionary enthusiasm but to direct self-interest." Committee activities at this time have been described as "bringing Russia to the brink of economic collapse," but more to the point is the fact that the committees were forced to assume extensive new responsibilities and powers at precisely the moment when they could least effectively meet them, and when any action whatsoever on their part was bound to create dissension, or worse. In contrast to 1917, moreover, the "bourgeoisie" was now a much less ready target for worker dissidence. The familiar cry of 1917 that the government was defending "capitalist" interests could no longer explain the lack of effective state intervention. Particularly heavy tasks fell on committees in plants formerly tied to military production; and where a shift had been made to natural wages, committees could never satisfy demand. Frequently this also required the use of armed force, although there were many other reasons as well why committees built their militias in these weeks. Goods needed protection, committee meetings were often disrupted, attacks on warehouses, storage sheds, even rail lines began to occur almost daily. Clashes between groups from different factories also became more frequent as conditions deteriorated. Even dormitories were invaded; and as factory militias tightened their control at plant gates, employment documents came to matter as much as ration In these circumstances the reemergence of both craft consciousness and factory particularism was inevitable. If maintaining a job in a particular shop or factory became one's primary source of security, local commitments naturally had to increase. The tasks which now seemed most urgent in personal and practical terms were simply not conducive to sustaining broader allegiances, particularly since the principal goal for which the workers had mobilized in 1917-the overthrow of capitalism and the creation of a "workers' state - had now been achieved. One's occupation again came to matter significantly in the spring of 1918, in other words, for workers as well as for others, and in ways hardly conducive to harmonious social relations even within factory gates. Evidence is skimpy, and one can only hypothesize about the degree of real conflict that arose on these grounds, but both the available evidence and the logic of events press in this direction. It seems inevitable that the committees themselves-facing impossible tasks, unable to meet workers' needs and demands, and now in some places working closely with technical personnel or even former factory administrators-should have increasingly become the objects of workers' anger, even as (and in fact precisely because) their powers were increasing. Workers at the Nobel factory (chemicals), Old Lessner (metal processing), and the Okhtenskii powder works (chemicals) turned against their own factory committees in late January and February, for example, because of "excessive discipline" and "inadequate administration": those "privileged" to sit on committees were now acting "too much like factory administrators," even "carrying out their orders" and "defending employer interests, not ours." "Comrades elect their factory committee and within a week the grumbling begins." New factory meetings are called, new instructions issued from the workers, and soon "the cycle begins again." This antagonism, moreover, ran both ways, since from the committee members' viewpoint the hostility of the rank and file was hardly fair. It was also a genuine threat to plant operations and led to new demands for discipline, often accompanied by charges of laziness and irresponsibility. Events were coming full circle, back to the very issues of concern and protest in the spring of 1917, except that now they occurred under Bolshevik rule and hence were necessarily focused on the workers' own representatives. One must emphasize the contradictory nature of these pressures in the late winter of 1918, and appreciate as well, finally, the manner in which they reinforced simultaneously a commitment to collegiality and democracy within many enterprises, a desire for autonomy, social tensions and demands for effective state intervention. Autonomy was necessary because factories everywhere needed to protect themselves from the "paroxysm of requisitioning taking hold of all official agencies," as some leather workers expressed it. Effective state intervention remained necessary because of the overwhelming need for orders, goods, and essential supplies. Plant democracy, finally, was essential not only because of the workers' own political commitments and values but also because the factory committees themselves recognized that "rank and file confidence" was critical to sustaining production, as the chairman of the Nikolaev railroad committee put it, and that complex production problems simply were not amenable to any other form of management on a local level. The trust and cooperation of the workers they represented were the committees' best hope for maintaining any production whatsoever. Lenin's approach to these issues, and that of most Bolshevik leaders, is familiar: economic chaos was essentially the consequence of prerevolutionary circumstances; the factory committee movement reflected dangerous anarchistic and syndicalistic tendencies, as it had even in 1917, despite its importance as a political base for the party; factory administration had to come under the centralizing and coordinating control of the trade unions, which themselves had to be integrated into the state and party administration of the Bolsheviks. Almost without exception, spokesmen for the various central boards (glavki) and commissions set up within the new Sovnarkhoz structure condemned the autonomy and independence of factory or railroad committees and assailed the workers for their lack of discipline. "There are no collegial administrations anywhere in the world like ours," a prominent Bolshevik authority on the railroads complained, for example, "where the majority of members are switchmen, engineers, and other rank-and-file employees. "N Osinskii (Obolenskii), head of the Supreme Economic Council, described workers' control as a form of "disintegrative syndicalism"; trade unionists like A. Lozovskii demanded that constraints be placed on the committees. On March 23 the Sovnarkom issued a decree "On the Centralization of Railroad Administration," placing "dictatorial power" in the hands of a single person in each administrative center, and making clear by implication its future plans for industrial management everywhere. Yet it was just this confidence in the efficacy of one-person leadership (edinonachalie) that startled the committee members themselves. From below it simply did not seem possible that most plants and enterprises could be managed in this way. "If it were only the case that a dictatorship would improve matters," workers discussing the March 23 decree insisted, "the question of what to do would be clear. But . . . we've heard these songs sung for years. In the past, these 'iron hands' brought nothing but trouble." Indeed, it seems apparent that many workers themselves, particularly in Petrograd, had now come to believe again, and with some justification, that confusion and anarchy at the top were a major cause of their difficulties, just as they had been earlier. An endless series of miscalculations occurred in these weeks. Scores of competitive and conflicting Bolshevik and Soviet authorities issued contradictory orders, which were often brought to the factories by armed Chekists. The fact was that Bolshevik administration was chaotic. The Supreme Economic Council itself operated from Osinskii's suite in the Hotel Astoria, issuing dozens of orders and passing countless directives with virtually no real knowledge of affairs. Scores of technicians were dismissed from above in this way, despite the insistence of workers' committees that their skills were crucial to operations and despite the view of some officials, like the Commissar of Transport, that dismissing them was "absolutely wrong." Demobilization was unplanned; the evacuation of Petrograd chaotic. The greater the authority of the center in these weeks, the more factories like the Parviainen works found their own supplies requisitioned".Accusations of 'anarcho-syndicalism' have always come in Russia from anti-worker, right-wing elements," one railroad committee spokesman put it; "how very strange that representatives of Bolshevik power now join in similar denunciation”. Thus a third stage began to unfold in the evolution of Bolshevik labor relations after October, following the initial weeks of "triumph" and the period of traumatic demobilization and rapid socioeconomic decline in the winter, a stage that soon led to open conflict, repression, and the consolidation of Bolshevik dictatorship over the proletariat in place of proletarian dictatorship itself. Brest- Litovsk was clearly a turning point, in Petrograd and elsewhere. If we can judge from newspapers like Petrogradskoe ekho, a reasonably objective non-party evening daily, the peace treaty seemed "treasonous" even to state workers at the Tula armament works, "destructive to the international proletarian movement, and deeply harmful to the interests of Russian workers, the revolution, and the Russian economy in general." There were also feelings of panic in the capital that the peace would not hold and that the Germans would soon enter the city. Groups of Putilov workers demanded immediate payment of one-and-a-half month's wages, insisting that Soviet power was their power and the demands of the previously exploited (nlzy) had to be met. It is hardly surprising that worker opposition to the Bolsheviks also became much more visible in these weeks, partly organized around the Conference of Factory Representatives in Petrograd and Moscow. Until March the only major outbreak of worker protest in Petrograd occurred around the closing of the Constituent Assembly, when a number of demonstrators were killed and wounded. Thousands had gathered at the Obukhov works in the southeastern district of the city and at nearby plants in the Nevskii district, including the important Aleksandrovsk locomotive works. There were also protests at several plants in the Vyborg district and at the Trubochnyi works on Vasil'evskii island. Some of the protest was undoubtedly stirred by SR and Menshevik activists. The Obukhov works was known as an SR "stronghold," and there was clearly still considerable support for both parties, particularly their left factions, throughout the city. Yet in some ways these protests seemed to mark the diffusion and even irrelevance of organized party politics at this juncture. Speakers denounced the shootings, attacking the Sovnarkom and the Petrograd Soviet, and expressed outrage at the closing of the Assembly, but the greatest shock seemed to be over the brutality with which Bolshevik forces had turned "on their own." The protests were also centered in major state enterprises engaged in war production and directly affected by demobilization. T.hus the deteriorating social circumstances of "favored" workers in proletarian Petrograd may well have begun to eclipse the issues of politics per se, while the Bolsheviks' condemnation of the shootings and their courage in addressing angry workers (particularly at Obukhov, which had suffered a large share of the casualties) tended to depoliticize the anger of the workers. In any event, in the aftermath of the Assembly's closing many in Petrograd seem to have become genuinely indifferent to the struggles and the fate of other parties as political organizations, as if they belonged to the days before October. In my opinion the emergence of the Conference of Factory Representatives as a center of worker dissidence must be understood in this context. In mid- January a meeting described in the press as a "Workers' Conference of the Union to Defend the Constituent Assembly" took place in Petrograd, organized in the main, apparently, by self-described "right" Mensheviks disaffected from their Central Committee over the question of cooperation with the Bolsheviks, and determined to build a new, representative movement "from below," shedding formal party affiliation. Workers from a number of plants soon joined them in forming the Conference as a broadly based assembly, hoping among other things to counter what one observer lamented as the new "passivity and indifference" of the Petrograd workers. The first "extraordinary" meeting of the conference convened in Petrograd on March 13 in the midst of new protests over the evacuation, which was pursued most intensively just before Brest-Litovsk, when it seemed the city might fall under German control. Delegates attended from at least fifteen major metalworking plants, including the Obukhov, Trubochnyi, and Aleksandrovsk mechanical plants, which had been the scenes of protests in January, and a number of print shops, which were, of course, Menshevik stronghold. The delegates' mood was angry and focused directly on those seemingly responsible for the "chaos of evacuation," food and other shortages, and the arbitrary exercise of authority, but it was also confused and desperate. "The workers are lost," a spokesman from Rechkin declared, "it seems to them that everything is falling apart." Reports of the March 13 conference appeared in Den', Novaia zaria, Novaia zhizn', and other Social Democratic newspapers, as well as in Petrogradskoe ekho and what remained of the non-party press. On April 7 the Menshevik Central Committee officially endorsed the conference, yielding to the right Menshevik conception of "appealing broadly to workers' gatherings in order to facilitate the formation of working-class consciousness and reconstructing labor unity," or as Liber put it at a Moscow committee plenum one week later, allowing workers to feel "the strength of their class position." By this time there were apparently delegates in more than 40 Petrograd enterprises, officially "representing," if that is the proper term, 55,000 or more workers. Five meetings were reportedly held between March 13 and the end of the month. According to an account published in Den', 33 of the 110 participants at the March 13 meeting were SRs, 35 SDs (obedinentsy), one a Narodnyi Sotsialist, and 42 did not belong to any party.70 On April 3 a second "extraordinary" meeting took place at which the Bolsheviks were attacked quite directly for "assaulting the workers' movement with tsarist rnethods”. What is most important in all this, I would suggest, is not so much the weakening of Bolshevik support it seems to evidence as the way it illustrates the powerful, contradictory pressures building from below in the spring of 1918 for solutions to problems which, at the time, were insoluble. What seems most striking about the disaffection evidenced in the conference is its focus on the breakdown of order, its disillusionment with revolutionary politics generally (party affiliations notwithstanding), and its insistence on a greater degree of local plant autonomy, despite overt hostility toward plant administrators and the delegates' own factory committees. Conference delegates attacked not only the Bolsheviks but also the soviets, "which have ceased to be the political representatives of the proletariat and are little more than judicial or police institutions." They condemned the Red Guards for their brutality but demanded more protection for their dormitories and factories and asserted their own right to use force. They demanded an end to restrictions on movement and freer trade regulations, following their Menshevik and SR leaders, and also insisted on the right to manage their own affairs, while bitterly attacking trade unions and their own factory committees for "not fulfilling their obligations to the workers The war has ended but our misfortunes are only beginning. There is little work; a senseless, disorderly evacuation has virtually destroyed industry. Workers are being thrown out on the streets by the tens of thousands. It is impossible to go anywhere. and there is nowhere to go. Our last coins are being spent. A hungry summer is coming. We cannot expect help from anyone. Are the trade unions doing much for the unemployed? They aren't concerned with the unemployed, and aren't even concerned with the employed. The unions organize the economy, not the workers. There were strong overtones here as well of rank-and-file hostility to the more privileged workers who now may have controlled many factory committees, and whose factory positions, in any event, were more secure. In the view of many, an "irresponsible technical apparatus" was now in charge of many factories, falsely representing rank-and-file interests: "[Our committees] ought immediately to refuse to do the things that are not properly their real tasks, sever their links with the government, and become organs of the free will of the working class, organs of its struggle." "We state honestly and openly that we have lost all faith in those above us." These views, moreover, were no less strident for the fact that those "above" them, in committees and unions, were also struggling with authorities in almost precisely the same manner and were being condemned for anarchism and acts "contrary to proletarian state interests." Obviously this generalized (and to some extent internally contradictory) protest was partly the result of the efforts of SR and Menshevik activists. But evidence on the social composition of conference delegates indicates it was also related, and more closely, to Petrograd's critical socioeconomic circumstances. In effect, only two major industrial branches were represented in conference meetings, printers and metal workers; and the largest number of "delegatesnthe nature of actual representation remaining an open question-came from 26 metalworking plants formerly engaged in defense production, including seven that had been entirely shut down. The only other significant representation came from 16 typesetting and print shops, strongholds of Menshevism. Only three of 'the city's food processing plants sent delegates, all from the Rozhdestvenskii district, and only two delegates represented wood workers. Most striking was the almost complete absence of textile workers. The one exception was the Tornton (Thornton) plant in the Vyborg district, where approximately one-third of all the factories "represented" in the conference were located. Why this may have been so is suggested by employment statistics. For the 28 factories with delegates in the conference for which we have data, the average unemployment rate on April 1, 1918 (contrasted with January 1, 1917) was 50.5 percent. In contrast, the average unemployment rate for 36 major non-participating factories for which we have data was only 21.6 percent. 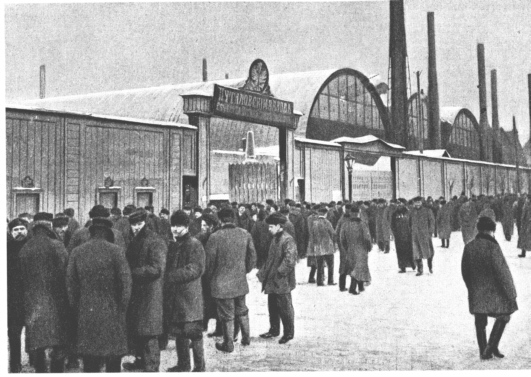 The Skorokhod leather works, for example, which did not send delegates to the conference, employed almost the same number of workers in April 1918 as in January 1917 (4,900). Similar situations existed in the Bogdanov tobacco plant (1,669) and in the Laferm tobacco works, which actually showed an increase in employment (2,363 to 2,507). Most important, it seems evident that the relatively small declines in employment among Petrograd textile workers affected primarily those working insmaller shops, and that employment in larger plants, which had experienced their "shake out" many months earlier, held rather steady. Thus the Nevskii cotton plant continued to employ more than 1,700 workers in April 1918, compared to 2,056 in January 1917; the Kersten plant in Vyborg, 1,070 compared to 2,252; and the Sampsonevskaia works, also in Vyborg, 1,618 compared to 1,592 in January 1917.76W hile other factors undoubtedly also affected the workers' connections with the Conference of Factory Representatives-the role of SR and Menshevik activists in the factories perhaps most of all-the importance of social circumstances also seems to have been paramount. It is possible to get a clearer picture of the conference participants by taking into account the patterns of evacuation from Petrograd and the general content of discussions at conference meetings. Thus the animosity shown toward factory committees makes it unlikely that conference leaders were closely tied to workers' control organizations or the unions. Besides, most of the skeleton crews that continued to work even at plants which had closed tended to consist of skilled workers and technical personnel. Finally, as noted, the least skilled laborers in the metal plants constituted the largest group of evacuees, while the most recent arrivals to the city, those with the closest ties to the countryside, were also the largest category of workers to leave voluntarily. Hence the largest group of conference supporters from the metal plants (as well as, in all likelihood, many of the delegates) were probably from the group of semiskilled workers who had moved into important jobs with the great increase in military production during the war, but who now found their hopes for security and advancement crushed by an economic collapse that left them vulnerable and expendable. The only other significant group of delegates, the printers, undoubtedly came in part because of their close association with the Mensheviks, but probably also because of the specific threat Bolshevism represented to the livelihood of what in 1917 had become one of the city's most rapidly growing industrial sectors. Thus they may well have been pushed toward the conference by social circumstances they shared, or felt they were about to share, with the metal workers, as well as by political convictions. By April 1918 a range of dissidence had emerged in Petrograd, reinforced by-and also doubtlessly reinforcing-the various forms of craft and factory particularism that had become so important in conditions of social dislocation and economic disaster. All dissident elements, from the overworked and harassed factory committees to the idle and anxious unemployed, demanded effective state intervention, particularly in Petrograd in the matter of evacuation but elsewhere too. Among many there was also an abhorrence of political repression and arbitrariness, as well as varying degrees of sympathy with the opposition parties. The question for conference leaders was whether these various strains could be effectively combined. On May 9, 1918, at the town of Kolpino, near Petrograd, armed guards opened fire on an angry group of workers protesting at the local soviet over shortages of jobs and food. Word of the shooting spread quickly, and while the incident was hardly the first of its kind, it triggered a massive wave of indignanation. The Conference of Factory Representatives met to demand "the complete liquidation of the current regime." Work stopped temporarily at a number of plants. Popular outrage spread rapidly. Like the Lena shootings in 1912, Kolpino quickly emerged as a focal point for more generalized anger and frustration. In Moscow, Tula, Kolomna, Nizhnii Novgorod, Rybinsk, Orel, Tver', and elsewhere, workers gathered to issue new protests, in some cases identifying themselves openly with the conference. "The suffering of the masses has reached an extreme limit," one group insisted: "Tak dal'she zhit' ne l 'zia . In Petrograd textile workers went on strike for increased food rations, and a wave of demonstrations spread in response to still more Bolshevik arrests until, at the end of May, a long meeting of the conference asked workers to postpone further protests "until a more favorable moment," when better organization and coordination could lead to a city-wide, and perhaps nation-wide, general strike. It is now possible to trace this first major wave of labor protest through to its climax in early July, and to understand its various dimensions. Information is available from contemporary newspapers and journals on more than seventy different incidents in Petrograd between Kolpino and the beginning of July, including strikes, demonstrations, and anti-Bolshevik factory meetings. Some of these were meetings convened in conjunction with Petrograd soviet elections held at the end of June; others were less focused. Some were addressed by speakers Trom various oppositional parties. The greatest number by far were protests against some form of Bolshevik repression: shootings, incidents of "terroristic activities," and arrests. In about 40 instances workers' protests focused on these issues, and the data surely understate the actual number by a wide margin. There were also 18 separate strikes or other work stoppages with an explicitly anti- Bolshevik character. Many of these protests included calls for democratic political reforms. There are newspaper reports, for example, on seven large gatherings in May which passed resolutions demanding the Constituent Assembly be reconvened, following the program of the Conference of Factory Representatives. There were four other meetings at which the workers specifically demanded freedom of the press; only one of these meetings seems to have been attended primarily by printers. Very few protests, in fact, appeared directly related to what one might consider social issues: unemployment, the cost of living, wages. Of these, most were strikes and protests over food shortages of the kind that triggered the Kolpino incident, particularly on the part of Petrograd textile workers, a contingent that was largely female and whose factories were still running. Thus on the surface at least workers' protests seemed to be assuming a new and stronger political content, and one can readily understand in examining them why hopeful observers like Aronson became convinced that by June 1918 "a committed opposition . . . [had] gained the upper hand." Political values and affiliations seemed to lie at the heart of these protests; indeed, one can hardly deny their political character or import. These protests, moreover, were not limited to Petrograd, and in many places elections to local soviets began to return large numbers of Menshevik and SR deputies, even majorities. Yet on closer examination the broader social dimensions of this protest are also apparent, and in ways that suggest again that social issues continued to be as important, and perhaps more important, than politics per se as an underlying source of protest, despite the political effect of almost every demonstration and work stoppage. Most important again is the narrow industrial sector at the center of most protests in Petrograd. The overwhelming preponderance of protests came once more from displaced metal workers. More than 75 percent of all incidents I have been able to catalogue in Petrograd between the end of March and early July 1918 involved this group. The largest number by far continued to occur in plants like the Patronnyi works and the Arsenal in Vyborg, the Obukhov works in the Nevskii district (where 2,500 workers, with close ties in the past to the SRs, continued to struggle to fill state orders for locomotives), and Putilov-all of which had been devastated by the chaos of demobilization and evacuation. Only a handful of protests, largely brief strikes over food rations, came from the city's textile plants, despite reports in Tekstil'shchik that workers there felt "things [were] worse now than under the tsar." Although the evidence is incomplete, the patterns still seem obvious. They also correlate with assumptions about the social composition of conference delegates and are further reinforced by evidence on their geographical distribution, which shows a heavy concentration in two districts, the Nevskii (Obukhov, Nevskii shipbuilding, the Aleksandrovsk mechanical shops), and Vyborg (Arsenal, Staryi Lessner, the old Baranovskii works, and the Patronnyi plant). There were also a number of protests in the Narvskii district, but on examination these seem almost entirely connected to Putilov. Other districts, including Vasil'evskii, were relatively quiet. Even in rough outline this configuration thus reinforces the conclusion that protests came overwhelmingly from the ranks of displaced, semiskilled metal workers, who were, of course, geographically concentrated here. Finally, one can also see further indications in these weeks of continued conflict between factory committee personnel and their rank and file; between higher paid skilled workers and their less well off, less skilled comrades; and of course between virtually everyone still struggling with the tasks of production at the factory level and those attempting to impose discipline from above. At Simens- Shukkert and Obukhov, for example, there were incidents of violence as unemployed workers attempted to prevent others from entering the plant; at Putilov, shop committees openly refused to implement the directives of the factory committee and demanded a city-wide meeting to discuss inequalities in wages. At a meeting of Vyborg district factory committees in mid-June, organized by the metal workers' union, representatives stressed that production work was being greatly hindered by negligent and hostile attitudes toward them on the part of large numbers of rank and file. Strong anti-Bolshevik feelings remained evident throughout. When meetings began in mid-June in connection with the Petrograd soviet elections, prominent Bolsheviks had real difficulty making themselves heard in many plants.88 But the importance of political commitments must again be set in the social context, and in these terms, as well as in terms of the way the political drama was played out in Petrograd at the end of June, the role of such issues as the Constituent Assembly and democratic government again seems to fade. On June 20 V. Volodarskii, a popular and talented Bolshevik publicist and 'member of the Soviet Executive Committee, was killed on his way to an election meeting. This time reprisals were particularly swift. Large numbers of people were arrested, including, apparently, many workers. Again angry meetings took place in factories around the city. At the Obukhov works the workers were joined by a large delegation of sailors in issuing an appeal to the Conference of Factory Representatives to declare a one-day strike of protest on June 25. The Bolsheviks responded by "invading" the whole Nevskii district with troops and shutting down Obukhov completely. Meetings were forbidden everywhere. This time, however, the workers were not so readily pacified. In scores of factories and shops protests mounted and rapidly spread along the railroads. On the evening of June 26 the conference met in another "extraordinary session. Reports estimated that out of 146,000 workers still in Petrograd as many as 100,000 supported its goals. As a result a general strike was declared for Tuesday, July 2nd. It is not really necessary to describe subsequent events in any detail, or to examine the organization and ultimate failure of the general strike of July 2. Zinov'ev and others took quick counter action, particularly on the railroads. Any sign of sympathy for the strike was declared a criminal act. More arrests were made. In Moscow the Bolsheviks raided the Aleksandrovsk railroad shops, not without bloodshed. Dissidence spread, particularly on the Nikolaev, Moscow- Kazan', and Moscow-Kursk railroads. In these circumstances, after meeting all night on June 28, the Sovnarkom issued its famous decree nationalizing all major branches of industry. The measure had long been contemplated but had been resisted in part because it meant the state would formally assume the responsibilities and (unmanageable) tasks of administration in nationalized plants, at least indirectly. But it also meant a greater degree of state control. In both timing and intent, the irony was that the decree finally implemented what many workers had long demanded, even before October; but it was now the party's rather than the workers' need for security that had become paramount. On July 1, as if to emphasize the point, machine guns were set up at railroad junctions and other main points in Petrograd and Moscow. Controls were tightened in the factories. Meetings were forcibly dispersed. All of this proved sufficient for Lenin's government to maintain order. When the morning of July 2 arrived, most trains were running. By evening it was clear that the striking workers and the Conference of Factory Representatives both had failed, and that proletarian Russia had reached another important turning point. The events of late June signaled a crisis that was to extend through the assassinations of Wilhelm von Mirbach and M. Uritskii, additional strikes, the attempt on Lenin's life, and the unleashing in force of Red terror as the summer came to an end. Scores of additional arrests decimated the conference. There was soon little question that the era of workers' control was over, supplanted now by the programs of War Communism and by a party dictatorship determined to enforce its own view of proletarian interests on recalcitrants everywhere. Yet the history of proletarian Russia in the important first months of Bolshevik power indicates the weakness of the view that sees the consolidation of party rule in political terms alone, and the limits of explaining the workers' failure to maintain their own independence primarily in terms of Bolshevik repression. Without discounting the importance of force, one must recognize that the failure of July 2 was also evidence of the Petrograd workers' inability to mobilize effectively in defense of their self-defined interests and goals, as they had in 1917, particularly in Petrograd. We are now, finally, in a position to understand this failure, and to consider briefly what it suggests about the workers' movement and relations between the party and labor generally in the period immediately after October. The first point to be emphasized is that, in contrast to 1917, the promise of personal security and material betterment implicit in earlier labor activism was singularly absent in the spring of 1918; and unlike the Bolsheviks, neither the Conference of Factory Representatives nor other opposition groups had a compelling explanation for the new disasters besetting Russian workers or a clear and convincing vision of a viable alternative social order. The delegates called for a general strike in the name of the Constituent Assembly, civil liberties, a single, indivisible republic, and an end to repression, but these goals had little to do with solving the problems of food supply, unemployment, or production, or of constructing an effective state economic apparatus. Indeed, the disaster was beyond short-term relief. This was true as well before October, and one might argue that the promises of 1917 were false and illusory. But they nonetheless had political force, while in the aftermath of October promises of betterment were not persuasive. Important here, in my judgment, is that the workers themselves had largely completed the "expropriation" of Russia's bourgeoisie by the spring of 1918, and the "capitalists" could no longer be identified as the primary cause of privation and want. Mobilization in the course of 1917 involved a discernible social enemy. Bolshevik strength grew not only because of the party's relative organizational strength, but also because of the explanatory content of party views and p'rograms, and because workers were compelled by economic circumstances to organize both offensively and defensively against the "bourgeoisie." The complementary tasks of proletarian social and Bolshevik political revolution thus coalesced, as did, indeed, workers and party "professionals," in a period of increasing economic privation and social polarization, and at a time when the Bolsheviks (and others) could provide most workers in Petrograd and elsewhere with clear ideas of an alternative-socialist-mode of production. The destruction of Russia's "bourgeois order" complicated Lenin's own task of maintaining a high degree of political consciousness among workers after October, but it made those of the Conference of Factory Representatives virtually impossible. The distinction drawn earlier between a Russian state and a bourgeois government no longer served to galvanize political resistance. Even as workers demonstrated against Bolshevik officials, the party remained a workers' party. Many who in the soviet elections voted for Mensheviks and especially Left SRs were really seeking "better" Bolsheviks. Efforts to build a politically more democratic order thus had little foundation in the broader patterns of social dissidence; while party politics themselves seemed irrelevant. Even more important, and for reasons that should now be clear, the Petrograd labor movement in 1918 was very narrowly based in social terms. It may well have been, as delegates to conference meetings believed in late June, that the overwhelming majority of workers in the city "supported" the goals of the conference. But those most active in the movement seem to have been preponderantly semiskilled metal workers, who, despite their strong protests in the spring of 1918, had long had close ties to the Bolsheviks. Probably their political loyalties still lay in that direction. Their dissidence seems to have been directed more toward obtaining effective relief than in support of the Mensheviks or other opposition parties; and votes of protest are never the same as a commitment to the opposition. In any event, they were concerned overwhelmingly with issues of social security and well-being, goals no political group could attain in the first months after October. Part of the opposition's difficulty also had to do with problems associated with the workers' own local organizations, particularly factory committees. It is conceivable that in somewhat better economic circumstances the Conference of Factory Representatives might have effectively allied itself with committee leaders in support of a more democratic political and economic administration. Yet not only were factory committees relatively powerless to protect the interests of the workers in the spring of 1918; they clearly became themselves focal points of worker dissidence, partly as a result of hierarchy and social stratification within the workplace, partly because their tasks now were necessarily so onerous, especially in Petrograd metal plants. Paradoxically, after October the proletarian dictatorship itself helped break the elements of worker solidarity that had been so important to success in 1917. One can similarly understand from this perspective why even many opposition figures within the party found it difficult to accept these democratic organizations as an institutional basis for Bolshevik administration, and why many factory committees themselves came to repress democracy in their plants. The pressures for authority were developing strongly under conditions of labor conflict, particularism, and devastating economic privation. The deeper Russia's economic crisis, the more desperate the need for effective state control, a fact that in the end must have left even dissident metal workers in Petrograd hoping that in the long run Bolshevik power would still represent their interests. For most Bolsheviks, conflicts among workers and the danger of anarchy posed real threats in the spring and early summer of 1918, and were rightly perceived as jeopardizing any socialist order whatsoever. Broader class consciousness and a muting of particularism also remained essential to any effective defense against the Whites or foreign intervention. In this respect the protests of May and June and the attempted general strike of July 2 may have served to impress party leaders further with the dangers of depoliticization and worker passivity, and with the need of strengthening class consciousness as in 1917. The protests undoubtedly also strengthened tendencies toward identifying and attacking "class enemies" and made new forms of repression more acceptable. In this sense, in the end, the ensuing civil war may have been as much an instrument of ultimate Bolshevik political strength as it was, simultaneously, a danger and further threat; and in any event, it marked as much the end of proletarian independence as the foundation of a new workers' state.